It’s been awhile, I know. Life went off kilter for a season, which I might tell you about one day, but not today. But I will tell you about the most spectacular thing that happened to me today. The best. I fell completely in love at first sight. On the spot, smitten, undeterrable love. Now to be clear, this has nothing to do with kitchens, but I am pretty content right now. And to be fair to my husband who I also fell in love with at first sight, I am also not talking about people. I am talking about boots. 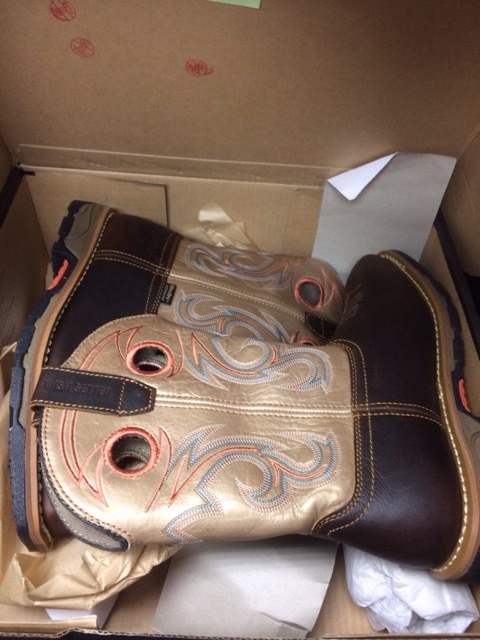 Beautiful boots. Now, before you judge me, you should know, if you don’t already, a few things about me. Like the fact that I am not fancy, I hate dressing up to go out, and I will choose comfort over appearance every time, which is why I am writing this while wearing my Lucky Charms t-shirt. I have a few pairs of lovely comfortable shoes but really my fashion sense starved to death a long time ago. When I do need something nice I will honestly go shopping with someone who knows stuff and beg them to help me. Clearly then I am not prone to whimsical purchases. And clearly my friends, when I say that I fell in love with a pair of boots, you should realize that I’m likely not talking about a pair of high heeled dress boots. So be warned, because beautiful in my eyes means fun and funky and practical and comfortable, and any other thing that just draws me in. And on sale, I don’t pay full price. So, I needed a pair of steel toed boots, you read that right, because my husband and I have some outdoor projects planned for the coming while. I don’t have the time for broken toes and in my estimation the cost for shelling out for a decent pair of boots is less than the cost of time, discomfort and pain meds if I drop a block on my baby toe. Easy sell. I happened upon a businesses back room assortment of shoes and boots of a local orthotics company, they had a room full of miscellaneous boots and shoes of all kinds that had been returned by clients after special order for whatever reason and the assortment was hit and miss with regards to size and style. I was hoping to get a deal on your basic work boots and to be dome with it but on the top shelf tucked away amongst loafers, running shoes and pumps was this glorious pair of boots that had clearly been waiting for me. I can’t even lie, when I opened the box I squealed a little bit, like a six year old on Christmas morning. I believe I actually said “Ooooohhh they’re so pretty!” True story. I am in love, yes they are indeed cowboy boots and I never said I wanted to own a pair, but they are just perfection. Aren’t they gorgeous? How could I refuse? They fit because the universe was working in my favour, I had a store credit and was able to hug the box to my chest and walk out the door for $30. I’m not kidding. 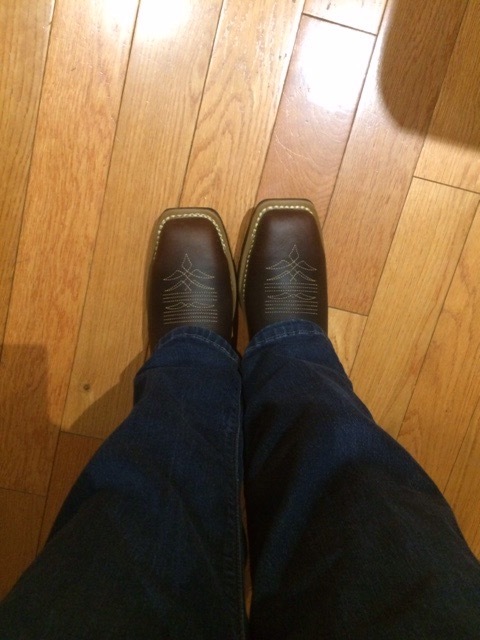 I came home and put them on right away because, well because I’m a grown up and if I want to wear my brand new boots in the house I am just going to do that. I’m telling you, these are so comfortable, I never want to take them off. My daughter was less enthused, but that just means she won’t borrow them. If I ever actually take them off. My next step will be to figure out how to wear them everywhere I go, which will be hard since I live in the burbs and work in an office. See, they are perfect, and awesome, and I love them. Of course they are also functional, steel toes, protective against electric hazards and waterproof. I don’t know that I will be able to live up to the adventure that these boots were clearly expecting, but I can try.